The following Wolf Dogs can be adopted by a good home from our Wolf Hybrid Ranch. 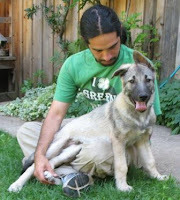 Please consider sharing our Wolf Hybrid Puppy Ranch with you family and friends. These puppies are super-socialized. Mother is Reiko - medium/large, mid-content Timber Wolf Dog (click here for Reiko's Blog) and Father is Vali - high-content, large Mackenzie Valley Wolf (click here for Vali's Blog). Litter is CKC Registered. Fry is a mid content timber wolf dog which was born in 2010. He is a neutered male. Take a look at is beautiful yellow wolf eyes. He loves the water. Fry's Adoption Fee is $100. Our wolf hybrid puppies for sale are raised in a natural environment in a secluded woody terrain. of the close proximity to the house for all the sections of the wolf forest and the constant interaction with our family, our puppies are raised with contact and intimate socializing.